Stardust Trumpeter returns as a Grade 2 Royal Paladin, with a powerful effect! AUTO Generation Break 1: [Counter Blast 1] When this Unit is placed on (RC) from the hand, and you have an “Alfred” or “Blaster” Vanguard, you can pay the cost. If you pay it, search your Deck for up to 1 card, Call it to (RC), and during that turn, it gains Power+3000, then shuffle the Deck. For Today’s Card, we’re introducing the Grade 2 Blaster Support Unit, “Starhope Trumpeter” from the Legend Deck “The Blaster “Aichi Sendou”” (on sale April 7th, 2017). 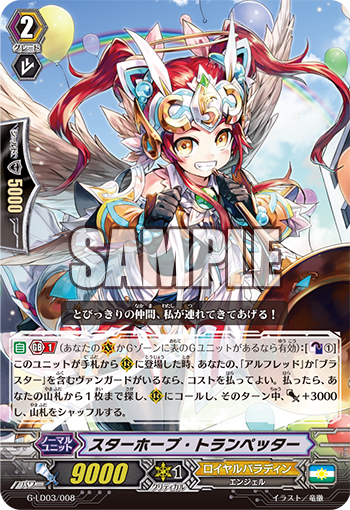 When “Starhope Trumpeter” is placed on the field from the hand, if you have an “Alfred” or “Blaster” Vanguard, you can pay 1 Counter Blast to Call any card you like from your Deck, then during that turn, it gains 3000 Power! It’s quite good if you use it in tandem with Units like “Hidden Sage, Miron” whose abilities activate when Called from the Deck. Also, since it isn’t tied to being in the same Column, you have an advantage to call the Unit you need depending on your hand. If you combine it with “Divine King of Knights, Alfred Holy Saber” to Call cards like “Blaster Blade”, so construct your strategy depending on the situation! For the foreseeable future, we’ll continue introducing cards included in Legend Deck “The Blaster “Aichi Sendou”” and “Fighter’s Collection 2017”! So please enjoy!